Literary Death Match: Vancouver. Friday, October 8th. 8PM SHARP! Official announcement, poster and social media campaign launch designed to drive awareness of the literary bloodsport competition happening in Vancouver in October. Vancouver’s W2 Storyeum location – also host to the W2 Real Vancouver Writers’ Series during the 2010 Winter Olympics – will host the event as part of the worldwide literary/performance/comedy phenomenon that is Literary Death Match. We’ve been eyeballing our northern neighbor for Literary Death Match purposes since this whole shindig began — but now, finally, we are beyond eager to (finally) make our LDM debut in Canada, with LDM100: Vancouver! Boasting a kneecap-tingling assortment of literary and humorous dextrousness, the flair-fueied evening will feature eclectic judges like Talent Time host Paul Anthony, the dazzling comedian/actor Diana Frances, and street artist/Vancouver is Awesome creator Bob Kronbauer. Amazing! But wait, there’s more! They’ll preside over four bring-down-the-house scribes including the hilarious Sara Bynoe, journalist and Tyee wordsmith Steve Burgess, master of comedy and writer, Charles Demers (Vancouver Special), and the amazing Nikki Reimer (author of [sic]). Plus! A full bar; awesome public art installations; worldclass DJs; and, of course, literary bloodsport! Hosted by LDM creator Todd Zuniga. Produced by Sean Cranbury. Cost: $10 pre-order, $15 at the door. All guests get free entry to the DJ event at W2 after LDM! Check out this great footage from the 3rd week of the Real Vancouver Writers’ Series. 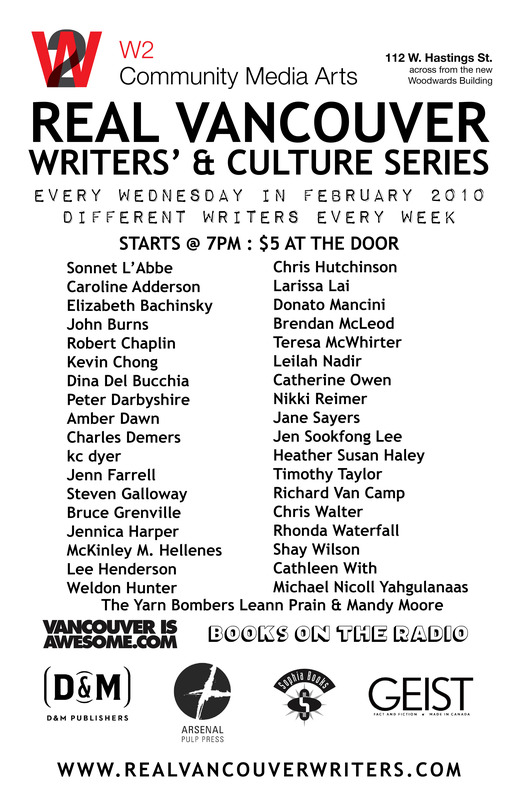 The line-up featured 12 amazing Vancouver writers, many of them poets. This video doesn’t include everyone but gives you a great sampling of what the night was like. Thanks to the fine people at the W2 Community Media Arts for filming, editing and posting this. Every Wednesday @ 7pm in February 2010. 112 W. Hastings Street. DTES!